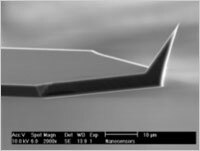 NANOSENSORS™ today introduced a revolutionary new probe type for Atomic Force Microscopy – the AdvancedTEC™. This highly doped monolithic silicon sensor is designed for precise positioning and high resolution imaging. It features a rectangular cantilever with a triangular free end and a tetrahedral tip that protrudes from the very end of the cantilever. This unique feature allows precise positioning and makes the AdvancedTEC™ the only scanning probe in the world that offers REAL TIP VISIBILITY through the optical system of the Atomic Force Microscope – even when the probe is slightly tilted due to its mounting. This makes it the premium choice for all applications where the tip has to be visible (e.g. nanomanipulation). The AdvancedTEC™ Tip is defined by real crystal planes which results in highly reproducible geometries and extremely smooth surfaces. Due to its very small half cone angles this new tip also shows great performance on samples that have a small pattern size combined with steep side walls. Different probe versions for common application modes like contact, non-contact or tapping as well as force modulation mode imaging will be available by November 2003. For further information please refer to the ATEC product-information or contact info@nanosensors.com.